In 2009, NOAA Fisheries, or NMFS, informed North Carolina that its estuarine gill net fisheries would be subject to federal closure unless the state addressed unauthorized takes of endangered and threatened sea turtles occurring in those fisheries statewide. Further, in January 2012, NMFS listed a population segment of Atlantic sturgeon that occurs in North Carolina under the Endangered Species Act . In response, the N.C. Division of Marine Fisheries, or DMF, obtained two Incidental Take Permits for anchored gill nets in estuarine waters. Also known as ITPs, these permits are for sea turtles and Atlantic sturgeon. 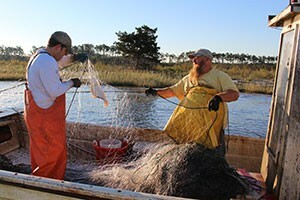 To maintain these ITPs and to keep the estuarine gill net fisheries open, DMF is required to provide onboard observers for a small portion of gill net fishing activity — approximately 1 percent of small-mesh and 7 percent of large-mesh commercial fishing trips. To explain the observer program, and clarify its value in keeping the fishery open, North Carolina Sea Grant worked with DMF to develop a short publication and two educational videos.